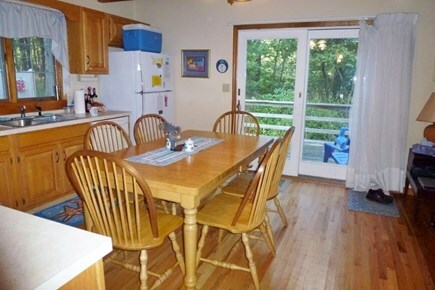 Fully equipped kitchen; table that opens to seat 10, light! view! 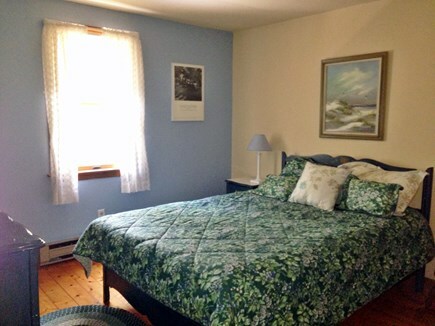 First floor bedroom: light, breezy and comfy! We have equipment for babies and toddlers too! Brand new wrap deck for outdoor living! Walk to town: galleries, playground, restaurants, Uncle Tim's! Beach: Walk to ponds by Natl Seashore trails. This fantastic 4 bedroom home is located on a peaceful wooded lot. 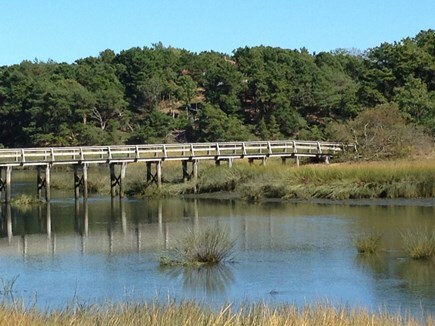 Walk to ponds, the National Seashore, and the village of Wellfleet with its many attractions including art galleries and restaurants. 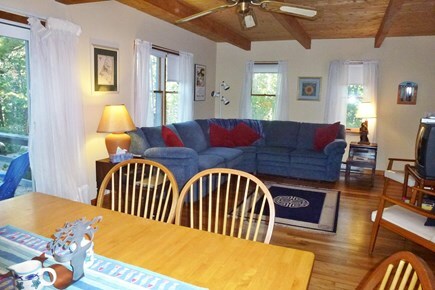 Suitable for 2 family rental, the home abuts miles of walking and biking trails through the National Seashore. 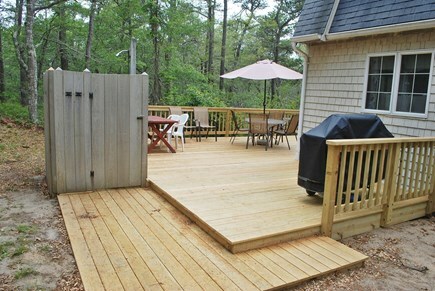 Enjoy dining outdoors on our new, large, wrap around deck and cooking on the gas grill. 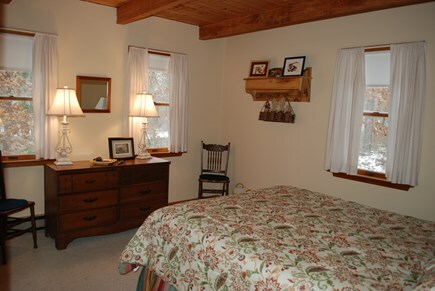 The house is comfortably and attractively furnished for easy summer living. We have a new fridge, a washer/dryer in the basement, and a dishwasher, too, for your convenience. Coming in 2019: new grill and some updated deck furnishings! New fridge and washer in 2017! NEW in 2016: Deck rebuilt and upgraded. Toys and games, beach chairs and umbrella provided. 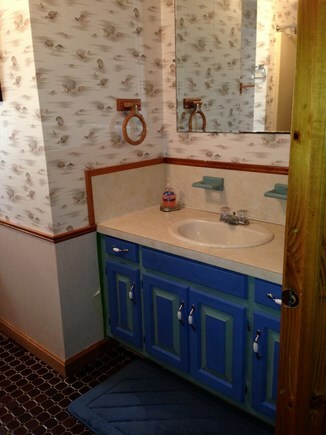 New in 2012: Beautifully remodeling of one bathroom and new hardwood floors. 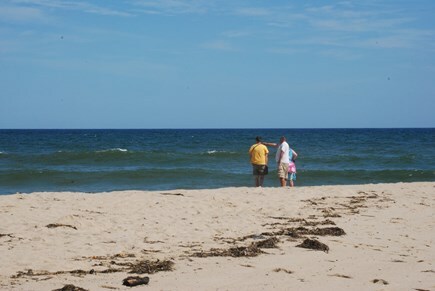 Nearest beach: Walk to ponds by Natl Seashore trails. Additional pricing info: State and local taxes apply. Discount for repeaters and multiple weeks. No cleaning fee. State and local taxes of 12.45% will apply. 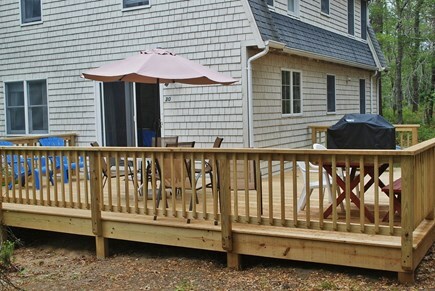 We redid the deck to make access without stairs possible. First floor bedroom and bathroom with shower. 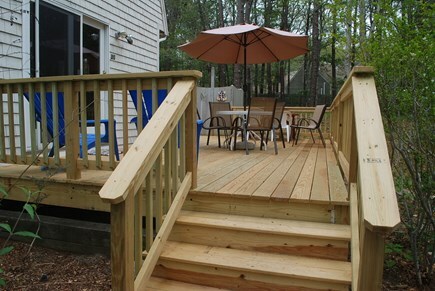 We loved this home and the spacious deck. 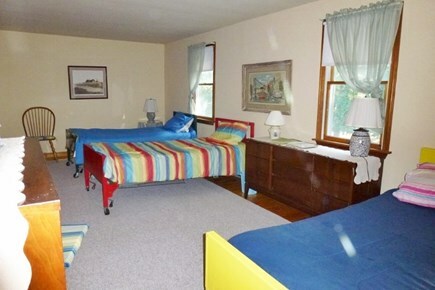 Bedrooms were large enough for our family of 6. Kitchen was well equipped and grill worked great. Location is perfect for beach and pond visits. We prefer Cahoon Hollow and were able to park the car early to get a spot after which we would walk or ride a bike back to the house (2 miles). We had two cars so we shuttled people to beach when they were ready. 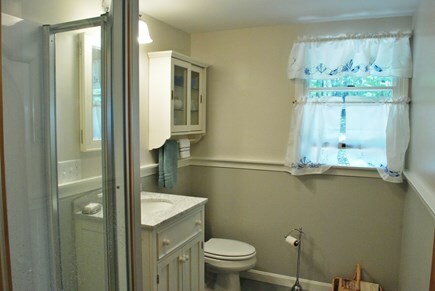 This home is tucked away from street and we had plenty of privacy! We came off-season and loved the peace and quiet of this lovely home. 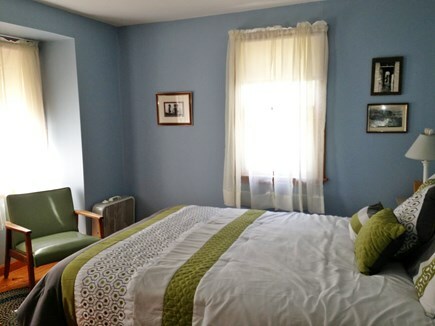 It's spacious, well-equipped and great for walking, bird-watching or just winding down. Loved drinking coffee on the deck. We're definitely looking forward to returning very soon. Family Fun on Cape Cod! We stayed in this house last July for a family vacation. It was great! 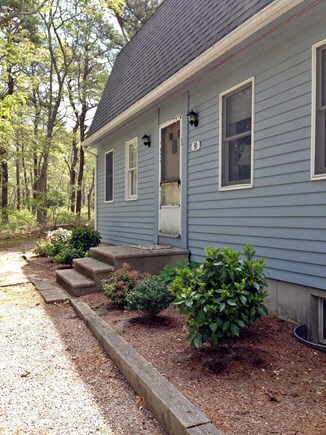 The house is close to a few different Wellfleet ponds and also ocean beaches. There are family friendly restaurants nearby. The street is quiet and tucked away from major roads. There were some beach toys and a high chair provided at the house as well. We've been vacationing in Wellfleet since 1965. We've rented Liz and Steve's home for half a dozen summer vacations. They have always been very professional, fair and helpful with making reservations. Their house is located on a quiet wooded dead-end off of Gross Hill Road. There's parking for several cars in their semi-circular driveway. It's easy to carry things in and out of the house. As the pictures show, there is a spacious wrap-around deck with room to sit and eat, a good BBQ, an outdoor shower and clothesline. that makes it easy to arrive home form the beach, drop your towel on the railing, and jump into the shower to rinse off. The kitchen's right off of the porch, so we comfortably move food & drinks between it and the porch. 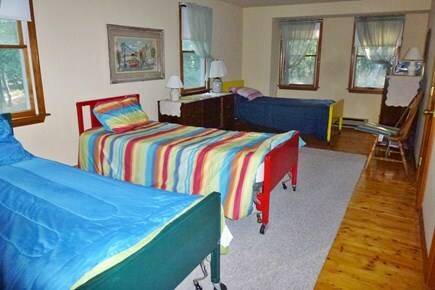 The bedrooms are comfortable, with plenty of windows for cross ventilation if the weather gets hot. Don't expect AC, however -- few houses on the Cape use it. This house works well for multi-generational vacations. One set of grandparents can sleep downstairs, one or two couples can sleep upstairs, and the grandkids stay in the kids' room. My husband and I spent a fabulous week here before the height of the season. We needed a quiet getaway, and Welfeet has always been our favorite place for R&R. The house was perfect. We love to cook and made good use of the well-equipped kitchen. The house has great flow, and is super comfy - which we appreciated even though it was just the two of us. Our family spent a relaxing, sunny 2 weeks enjoying the lovely ambiance of the house, the Cape Cod beaches and restaurants, and super weather duing our stay. Our family has vacationed on the outer Cape since 1979. We have been homeowners for more than 20 years. 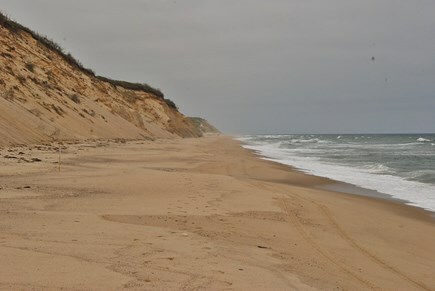 We love Wellfleet and will happily share information on our favorite restaurants, beaches, trails and activities with you. We started out as renters ourselves when our children were babies. Now we vacation with them and with our four grandchildren. It's a wonderful family vacation spot. The National Seashore keeps the area from getting too built up and yet there is much to do and see in the summer season. We come a long distance to our 'home away from home' and, despite traffic, always feel it was worth the trip once we arrive. We walk into town to gallery openings, shops and restaurants, a bay beach and a playground suitable for kids of all ages. There are three good freshwater swimming/boating ponds nearby. We keep sand toys and other toys, books for adults and kids, and family games in the house. We are close to everything and yet safely tucked away on a wooded lot on a quiet, safe cul de sac. No, we do not hear traffic noise from the roads nearby. We can bike to Newcomb Hollow ocean beach, walk trails to the freshwater ponds (there's parking at these if you bring equipment.) There are three good freshwater swimming/boating ponds nearby. We walk into town to gallery openings, shops and restaurants, a bay beach and a playground suitable for kids of all ages. The town library is great and has a story hour and many interesting adult activities. There are movies for rainy days and miniature golf, a driving range and public tennis courts nearby. The nearby National Seashore Visitor's Centers also offer programming and is easily accessible. There's a great flea market on the grounds of a-- yes! Still operating!-- drive in movie theater nearby too.